Ikuyo Kuroda　（黒田育世） | 「踊りに行くぜ！！in アジア」2009-JCDNアジア巡回プロジェクト　vol.3　/"We’re Gonna Go Dancing!! in Asia 2009- JCDN Tour Project in Asia-vol.3"
I created this version of “Monica Monica”, trying to not take myself too seriously. Hence, I regard it as a place I dance with joy. It seems that different cities have resulted in different styles of “Monica Monica”. My deep desire to dance this piece has made me who I am today precious. I am deeply grateful for the opportunity to dance “Monica Monica” in its purest form. This new piece will be created during a 7day workshop with ASWARA Dancers, as a adaptation of“Last Pie”.“Last Pie” was choreographed by Ikuyo Kuroda for the program "Triple Bill"(2005) of Noism05, the resident dance company in Niigata, Japan at Ryutopia Niigata-City Performing Arts Center. Ikuyo Kuroda started taking classical ballet lessons when she was six years old. While being a member of Tani Momoko Ballet Company, she went to London in 1997 to study contemporary dance at the Laban Centre. 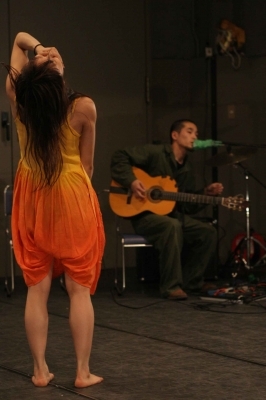 In 2000, she became a leading member of “Kim Itoh + the Glorious Future.” In 2002, she founded her own company “BATIK,” and won the National Conference Members Award at the Yokohama Platform of Rencontre Choregraphiques Internationales de Seine-Saint-Denis (formerly the “Bagnolet” International Choreography Award). In 2003, she won the Next Generation Choreographer Award as well as the Audience Award at the Toyota Choreography Awards. In 2004, she presented her new works “Flowers flow and time congeals” and “SHOKU”. BATIK was invited to the Dance Umbrella Festival in U.K. Of late, she has expanded her area of activities - presenting solo works, choreographing for Noism05 - led by Jo Kanamori, and participating as a dancer in“ASOBU” - choreographed and directed by Josef Nadj. She is currently choreographing a new piece for the Helsinki Dance Company in Finland which will be premiering on Aug.8 & 9, 2008. Her major works up to now include “SIDE B”, “Flowers flow and time congeals”, “SHOKU”, “pendanteve”, and “MonicaMonica” She won the Asahi Performing Arts Award and the Kirin Dance Support Award in 2005, and the Dance Critics’ Society of Japan Award in 2006. Born in Nara, 1976. He started training in piano at the age of 4, nunchucks (nunchaku) at the age of 7, and guitar at the age of 9. His start in the performing arts came when he worked as a musician during a performance of Kenichi Tanno. At present he is involved in performing arts as a musician as well as in other roles. As for his solo activities, he has played in theaters, live houses, a nursing home, and a youth prison both at home and abroad. He currently plays with an alcohol themed group of songs called “Underground Reservation” and has released the CD, as well, with the guitar band “BANESENPAI” with SKANK.